My Missie Purple mascot has finally made some new friends thanks to @irarmadilloboy! (aka Jason). Missie Purple (I haven’t really come up with a better name for her, unless any of you can think of anything more suitable? ), has always been a-kinda loner girl. So, at the beginning of this year, I tweeted @irarmadilloboy if he’d like to work with me on an illustrative piece – I was praying he’d not turn me down! (no-one, especially a girl, likes to be rejected). So I was well pleased when Jason agreed! Our brief was simple; something playful and with a Breakfast theme (what’s more appropriate since it’s the start of Breakfast Week? 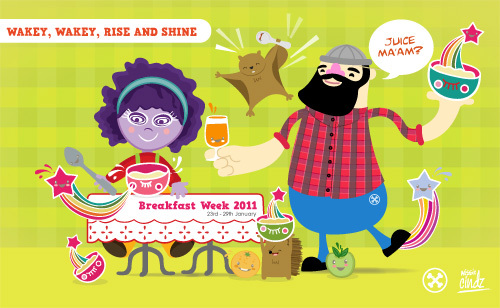 :) …so here’s our little something we put together to promote Breakfast Week 2011!! (found above). We all know how important breakfast is (we both do, without it neither of us can function properly!). Head on over to – www.shakeupyourwakeup.com/about – to learn more! Jason’s no stranger to hard work and dedication either which is why I’d like to say a very big thank you to him for giving up some time for doing this fantastic ‘special’ illustration. 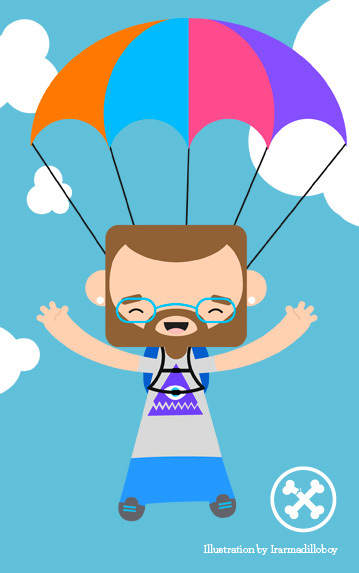 I was drawn to Jason’s playful and colourful portfolio when I stumbled across his Twitter Avator (lol) – the bearded bloke (also, found above). I think, us being in the same design profession also helped us to understand each other and what we were after. He has a playful vector art style; with graphics and unique characters that ooze confidence and defined personalities.